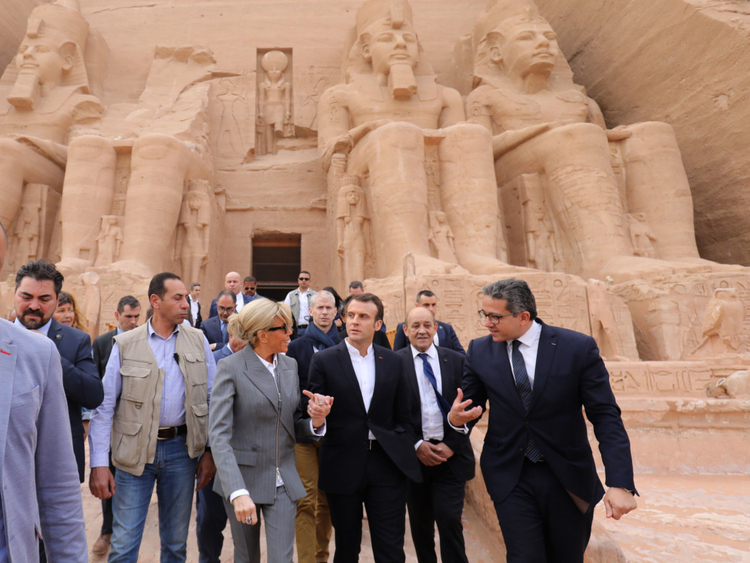 Cairo- French President Emmanuel Macron arrived Sunday in Egypt, stopping to visit the iconic temple of Abu Simbel in the country’s south before heading to Cairo. Macron’s three-day trip to Egypt comes as “Yellow Vest” protests against his policies continue to be held on the streets in France. The French leader is accompanied by his wife Brigitte and a delegation including Foreign Minister Jean-Yves Le Drian and Defence Minister Florence Parly. Macron is scheduled to meet Egyptian President Abdel Fattah Al Sissi on Monday for talks aimed at strengthening the “strategic partnership” between the two countries. During his visit, some 30 deals worth several hundred million dollars are expected to be signed in the fields of transport, renewable energy, health and agri-food. Macron was received upon his arrival at Abu Simbel airport by Egypt’s Minister of Antiquities Khaled Al Anani and the director of the French Institute of Archaeology Laurent Bavay. The ancient temple was built during the reign Egypt’s famed pharaoh Ramses II. Last year, Egypt celebrated the 50th anniversary of its historic rescue from flooding of the Nile. The French presidency said shortly before Macron’s trip that Egyptian archaeology has remained “at the heart of Franco-Egyptian relations” thanks to the work of Egyptologist Jean-Francois Champollion. French experts hope to be entrusted with work on archaeological projects in areas including the vast Saqqara necropolis, south of Cairo. They are also seeking to participate in the Grand Egyptian Museum, which is currently being built near the famed Giza pyramids, as well as the renovation of the Egyptian Museum in Cairo.